Since the late 1980s, the CAMEO® software suite has become the most widely used chemical emergency response and planning tool in the United States. A member of the Seattle Fire Department hazardous materials response team works with CAMEO in the hazmat vehicle. Who uses the CAMEO suite? First responders (such as firefighters and police services). State, local, and industry planners. How do people use the CAMEO suite? Aerial ambulance companies have used MARPLOT to provide the direction and distance to local hospitals to help expedite patient transport. 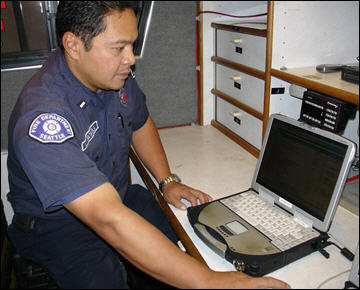 First responders make use of the entire CAMEO software suite of programs at the Weapons of Mass Destruction training developed by the Department of Homeland Security. After entering chemical inventories and special locations into CAMEOfm, some planners are assessing likely terrorist targets within their area using CAMEOfm. Estimating the number of affected residences in New Orleans. Mapping evacuation routes and collection sites for hazmat containers displaced by the storm. Defining exclusion zones around dangerous hazmat containers. Selecting safety gear for workers handling hazardous debris. The United Nations Environment Programme (UNEP) selected the CAMEO suite as a tool to help developing nations prepare for—and respond to—chemical accidents. Under UNEP's Awareness and Preparedness for Emergencies at the Local Level (APELL) program, CAMEO has been demonstrated or taught in 50 countries. Questions: Contact us with questions, comments, or suggestions about the CAMEO suite.